Newly completed building in the Center for Early Education Campus Redevelopment faces onto La Cienega Boulevard. At completion campus to feature 70,000 SF in two new buildings replacing two existing buildings, plus campus expansion, new subterranean garage, rooftop playgrounds and ground level play field. 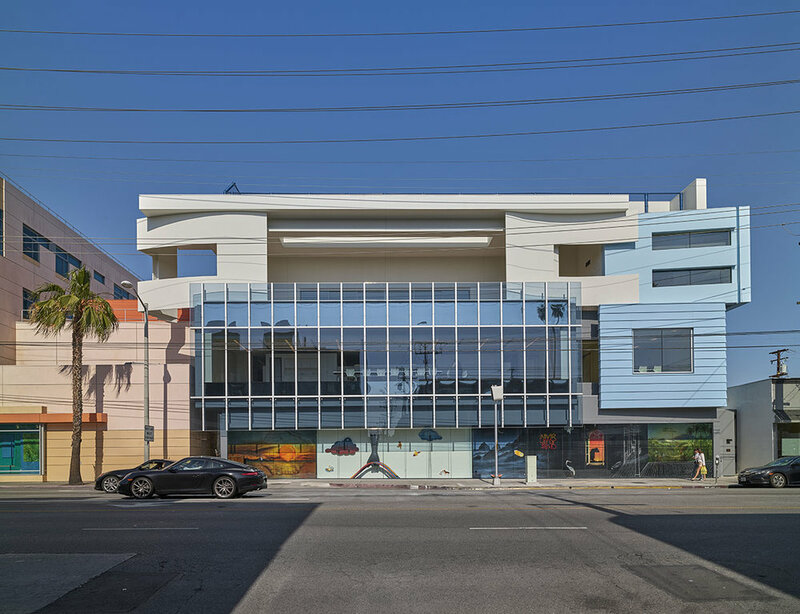 West Hollywood, CA (July 18, 2018) – The Center for Early Education, designed by Johnson Favaro, has completed its first new building – phase I – and broken ground on its second new building – phase II – after almost two years into a 3 ½ year comprehensive redevelopment of its 2 ½ acre campus in West Hollywood, CA. The two new buildings will replace two existing buildings in various locations on campus as well as adjacent recently purchased commercial and residential properties. The new project on La Cienega Boulevard and Clinton Avenue will connect as additions to an existing third building. This will create a single four story 100,000 SF building housing 540 students and 110 faculty and staff. In addition to classrooms and instructional support spaces for children ages 2 through 6th grade, the project at completion will include new below grade parking, rooftop playgrounds, a new ground level gymnasium, and a play field. “The architecture of the new campus is inspired by the spontaneous expression of children’s art – folded and cut-out paper, alphabet building blocks, brightly colored surfaces, simplified, almost child-like profiles of things found in nature like trees and flowers,” explains Principal architect Jim Favaro. The project is a model of compact development as an urban campus in a rapidly urbanizing area of southern California. The second new building – the “Clinton Building”– currently in construction, will house all the early education programs at the ground floor, with kindergarten, first and second grades at thesecond floor, administration at the third floor, and rooftop playgrounds at the fourth floor. This building will serve as the main entrance to the entire school and will feature a five-story atrium that connects a vestibule at the new below grade parking garage to the rooftop playgrounds at the fourth floor. The Center for Early Education was founded in 1939 and has been located on its current site since 1946. The Center is a socio-economically and culturally diverse independent school for children, toddlers through grade six. CEE strives to graduate students who are joyful, resilient, life-long learners and embraces a philosophy of education that combines a nurturing, inclusive learning environment with an increasingly challenging academic program that addresses the developmental needs of each child. Steve Johnson and Jim Favaro founded the architecture practice Johnson Favaro in 1988 in Culver City, CA with a commitment to the public realm where they believe excellent architecture has the greatest impact and is most appropriately experienced. For over thirty years Johnson Favaro has focused their work on schools, libraries, civic, cultural and community institutions, both private and public. The firm is founded on the principle that high quality and inspiring architecture in support of the social infrastructure of which these institutions are a part is crucial in the advancement of our democracy and civil society. Current work includes the new City of Riverside Main Library, the Museum of Redlands (MOR), the new administrative headquarters for UCLA Continuing Professional Studies, the new Center for Excellence campus for Anaheim Union High School District Magnolia High School and an Allied Health Sciences building for Southwestern College in National City, CA. Andrea Klabanova Blue Medium Inc.